It's another Monday morning, but we won't let that get us down as we have the European Nintendo Download Update to cheer us up. There are new titles to enjoy across Wii U and 3DS, some classics on the Virtual Console and a whole load of tempting discounts. Let's get to it. Family Tennis SP (Shin'en Multimedia, €4.99 / £3.99) - This franchise makes its Wii U début following some reasonable efforts on Wii and 3DS, with support of singles and doubles along with local multiplayer. We'll get into the swing of it for a review. Axelay (Konami, €7.99 / £5.49) - The immediate reaction from NLife editorial director Damien McFerran to this inclusion was "phroar, best shooter on the SNES ever", which sounds promising. In an era of scrolling shooters, this may be a stand-out; we'll jump in for a review. This is the US version of the game. Demon's Crest (Capcom, €7.99 / £5.49) - Firebrand the Gargoyle must set off to recover the six magical stones of the Demon Crest before the realms of humans and demons fall into the hands of his evil nemesis, Phalanx. Breathe fire, claw walls and hover across seven intense levels as you fight to save the realms from eternal unrest. It's as good as it sounds, as we explained in our review. This is the US version of the game. If you own any of these games on the Wii U you are eligible for the following promotion prices on the same system. 3D After Burner II (Sega, €4.99 / £4.49) - The first entry in this second wave of 3D classics from Sega, it brings some classic arcade action to the 3DS; you can pretend you're Maverick in eye-popping 3D, as an '80s marketing agency would say. We'll let you know what we think in a review. Monster Combine TD (Collavier Corporation, €3.99 / £3.19) - A blend of tower defence and card / board game, this is the latest title from the increasingly prolific Collavier Corporation. This one does seem intriguing, as you use cards to summon a range of monsters, having to take care to utilise the right abilities; it appears to use a Plants vs. Zombies style of tower defence with this card system. We'll stack the deck and see what cards we get in our review. That's the line-up for this week in Europe. Let us know what you'll be downloading in the poll and comments below. Axelay took a while to reach the UK. Been waiting for it since 2007, when it was released in America and Australia but not the U.K.
Well done Konami well done nintebdo. Afterburner and Demon's Crest for me! Good to see so many discounts, I guess. Nothing I don't own or am interested in, tho. Teslagrad on sale!!! I'm also gonna grab Afterburner too. Teslagrad and Guacamelee this time with that discount. The VCs will have to wait. Teslagrad and Guacamelee for me! Does anyone seriously pay those prices for the Angry Bird games? At £20 Tekken is a good price, now it's under £7 there's no excuses for anybody to pass on that game. Tekken file size is too big, that's a good reason not to get it. Considering one piece red wii u is one of the hardest games to track down in pyshical form this EShop discount is worth a look. Is explore the dungeon worth £5.99? Some say it only works as a multiplayer? @ThomasBW84 Small correction: Its Demons Crest, not Quest The one you probably thought of was Gargoyles Quest, its predcessor. But thats a giant maybe. Is pacman ghostly adventure 1 good? I might get Tekken as well. Somebody encourage or discourage me! Is it me or is the voting M.I.A.? Can't say no to Tekken TT2 for £7, it's the best version of the game, just a shame my fight stick probably won't work on it. I can't discourage you. It's the best Tekken in ages. If you've got the space for it, buy it now Thursday. It's a STEAL at that price. That Angry Birds Star Wars price especially on Wii U eShop. Teslagrad looks fine for this week, as does Unepic. So happy to see M2's new batch of Sega classics start to arrive. Thanks! The last Tekken I've played were the first PlayStation ones. I've been on the fence on this one. I'm convinced! I have a spare SSD I've been using for my downloads so no prob. Now anyone for pacman GS1? Europe gets both Afterburner and Axelay, that's a good week for shoot em up fans. I want the Super Indie sale in America! I already bought Bit.Trip 2 for $5 last month, and I need to buy Chasing Aurora, Swords & Soldiers, and Teslagrad! By the way, is the Wii U version of Swords & Soldiers the best? It's a great week for me.I was going to buy Teslagrad and Unepic last week too but something was telling me to hang on for a couple of more weeks to see if there was a sale.Think I'll go for Tekken too,can't not at that price. @dizzy_boy is it worth it? been looking at it for months but expensive. Axelay and Demon's Crest are very welcome titles. Demon's for being rare and ridiculously expensive and Axelay for some of the best graphics on the SNES, but is also a great game too if a little short and easy. Axelay, Afterburner II and Wii U Adventure Time for me. Yes, I know AT isn't great, but it's a bargain at that price so worth a punt I think. Runner 2, Guacamelee! and SteamWorld Dig are bargains - if you've not got them yet I thoroughly recommend downloading them this week! Nothing for me though I might get Afterburner after checking out footage (I liked the S&ASRT Afterburner track). I'm a bit confused about the Wii U Super Indie Connection Promotion. Does that mean if you already own the game on Wii U, you get a refund of an amount equivalent to the price difference? @Grumblevolcano Yeah,it's not worded very good.I'm of the impression that if you own any 1 of those titles ,then any of the others listed are available to you at the promotion price. @readyletsgo yes it's totally worth it, that's if you like fighting games though. The WiiU edition has Nintendo charecter themed suits for most of the fighters, plus you can customize your fighters aswell. Plus there's mushroom battle mode which is awesome in two player mode, if you have somebody over to play against. And there's a beach ball mode that returns from one of the earlier Tekken's. Online can be a bit quiet sometimes, which is a shame. Just don't forget to wait 'til thursday for the £7 deal. TTT 2 is a rather frustrating game. Worth the discount, but the Wii U's analog sticks are terrible for anything Tekken. Honestly, they're unresponsive and sluggish in comparison and for a fast moving fighter, it's almost inexcusable. For multiplayer, totally worth the investment learning the controls. For me, this week is a pass. NA gamer here, waiting for some VC games to finally make their way over here. Like, DKC, and Golden Sun 2. Axelay AND Demons Crest - great week! Although I'm making myself finish Gargoyle's Quest 2 before I get it, need to finish these games! Axelay! My favorite shooter ever accompanied with one of my favorite video game soundtracks of all time. It's pretty win. I love shoot em ups but I could never get into Axelay for some reason,same goes for US Squadron.Neither are a patch on any of the Megadrives best. Pac is a decidedly average 3D platformer. I got it on a sale and did not regret it because I paid like $13. If you like 3D platformers you could do worse, but of course there are much better games. Demon's Crest is basically the only thing I'm interested in or don't already have. Might grab Teslagrad though. Maybe. Thanks! I took a quick peek on the review. I think my 5yo kid may like it. I hope there's a coop on the campaign. I will read more later. Europe sure has been getting the good stuff lately. Well could be my busiest week ever on the Wii U eShop, Chasing Aurora, SteamWorld Dig, Teslagrad & Guacamelee! Super Turbo Championship Edition works out at £15.56 Teslagrad on its own is normally £13.99 so at those prices looks to good to miss. Add me to the list of "how much for Angry Birds Star Wars" on Wii U camp! I wouldn't pay that for AAA Nintendo titles. Teslagrad for me as i already own most of the other games. Buying Axelay. I remember this game so fondly on the SNES. Mostly because it was one of the few games my mum bought for me but also because it was bloody good! angry birds is 50 quid,Does Activision expect anyone to buy it at that price. May get Axelay. For some reason it was absent on the European VC on the Wii (thought this wasn't such a big problem, with so many other great shoot 'em ups released), and with the new save feature of the Wii U VC, old-school shoot 'em ups are finally a little less challenging, so that I may actually see more than the first few levels. Ah man, look at that indie sale. I hope it comes to America, because I wouldn't mind buying Guacamelee a second time. And Teslagrad looks pretty great as well. OK, good games and good discounts, but it is the fourth or fifth week without 3DS VC. I don't get it. New 3DS is on the way and I think people would expect some more attention here, but Nintendo doesn't. But oh well, we all know how Nintendo is treating VC in this generation. Sega/M2 is once again saving the cause by giving us some more classics. Axelay is indeed a very good shooter but i already have the original NTSC and PAL cartridges so i'm not going to fork out 8 euro. I'll add Axelay to my "get eventually"-list, and I'll check the discounts later. I already bought Ghostly Adventures 2 last month for 35€, so I'm a bit miffed. While GS1 and GS2 are both technically competent platformers, the level design in GS1 is so utterly bland that finishing it became a chore. The sequel, by comparison, lifts even more elements from Mario and Sonic, but the levels are far more interesting. The story is also told much better for someone uninitiated with the TV show. I'll go with Teslagrad - can't resist a 60% discount. That's a proper SALE (watch and learn Shin'en). Not a bad deal on Tekken Tag, will be buying that if it comes to the States for a similar discount of sub $7. I hope Teslagrad sale hits North America! Come on all you Hippy flag waving 'i prefer buying overpriced priced retail games on Wii U because its to difficult for me to get hold of a retail copy' thus supporting the overpriced model numbnuts show some love for angry birds star wars. Wow i wish those indies sales came to North America,i guess i'll have to wait. I own Swords and Soldiers on the Wii and have done the system transfer to my Wii U. Does anyone know if that qualifies me for the discount? Failing that, if I buy one of the games full price can I get the discount on the rest? I would love to get Guacamelee and Teslagrad. I think there is multiplayer but it is an extra mode, the campaign AFAIK is single player. And the game is geared towards kids so your 5 y/o may indeed like it. And with Axelay, the NOA and PAL VC releases get even more out of sync. Lovely. If the US gets the same sales.....I'll pickup either Teslagrad or SteamWorld Dig or both! Teslagrad, Guacamelee and SteamWorld Dig, etc at those discount prices are a steal. Really. Good to see NoE collecting some really good indies into a discount package. 3D Afterburner for sure. But I am even more excited about the upcoming 3D Outrun. @BensonUii No co-op in either Ghostly Adventures on Wii U, and only the first one has any kind of multiplayer mode as its own minigame. @heathenmagic I'm using a 32gb data stick to add to my storage space without any hassle. It's not recommended so I don't put saves or important things on it but it's easy and works! on the download front, maybe teslagrad at that price but I've got at least a ten game backlog so I'll buy some n64 cartridges for the collection with the money maybe!?! Demon's Crest and Axelay!!! So happy! I got it on sale at £10 last year on the eshop. It was fine because I barely had any games downloaded at the time. But over time I kept download and deleting games to make room. Now that I finally deleted Tekken, I can have all my other downloaded games on my system. I really need a external hard drive but I don't know much about which is the best for a good price. Axelay has been top of my Virtual Console wishlist since the service launched. Happy days! I never got around to downloading it when it was released on the Wii VC service, but I'll definitely download Axelay when it releases on the Wii U eshop in my region. 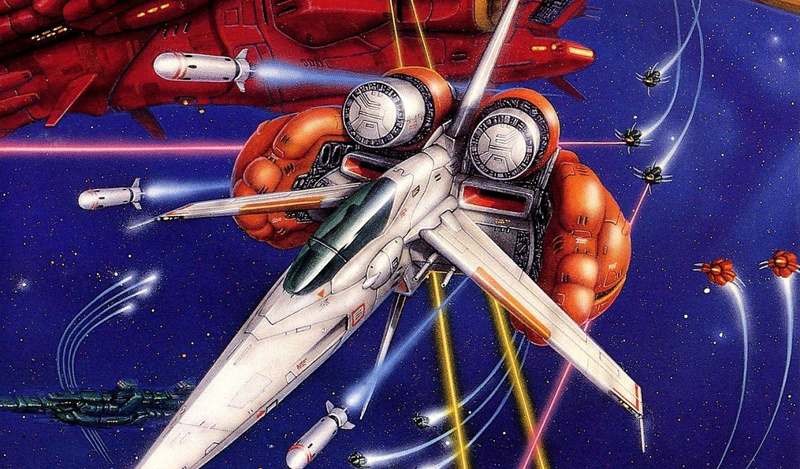 I might pick up after burner II as I really liked Galaxy force and Space harrier and for those who never played Demon's Crest. Go get it! It's amazing! I just brought "Pac-Man & the Ghostly Adventures 2" last week for £20. Talk about bad timing. I might get the first, as £8 is a fair deal. Also "3D After Burner"! YESSSS! Axelay and Demons Crest for me (don't miss Guacamelee and Bit Trip Runner). Slightly surprised to see Teslagrad going for so cheap considering it's coming out on disc soon. Everyone must buy Demon's Crest! The only thing I am interested in really is Project X Zone but I would rather have a physical copy. If the sale was €10 then I would jump at it. Demon's Crest and Axelay! What a week. Will probably finally pick up Teslagrad also. Steam World Dig's looking too fine for me to pass up! Might get Demon's Crest and git gud as well. Axelay and Unepic for me, maybe Teslagrad. Although I voted for axelay I'm def grabbing afterburner!! Cmon sega get on wii u already!! Talk about a pile of classics sittin' around not earning money jeez!!! @joey302 I really don't understand why SEGA are not experimenting with the Wii U Eshop.Even with the low install base,I am sure there are a lot of former SEGA fans amongst that base who would instantly purchase some of their classics.A steady stream of classics like Daytona,SEGA Rally,Virtua Fighter maybe with some additions like online leaderboards,Miiverse etc I'm sure would do quite well.Frustrating man! Wooh! Me thinks Axeley, After Burner II, Tealagrad & Steamworld Dig are on the cards. @joey302 The uk had a physical release but impossible to find even zero copies on eBay. @OorWullie I'm in the states but I agree with you 300% about Sega!! I don't get it at all!! They have hundreds of classics they can post on vc and original arcade classics too!! I think they're missing out on serious $$$$. I know my self I would buy 99.9% of whatever they posted in the eshop as I've done so on the 3DS and on Wii before as well! 8 million wii u installed base worldwide is not enough for them to get off the fence??? And lord knows Nintendo could use some help on wii u vc!! Jeez!! Sigh! @OorWullie I was thinking the same thing. But maybe they are hoping this will give the game more exposure, and create more fans. Some of those fans will likely double-dip in order to own a physical retail copy. I know I probably will if I enjoy the game enough digitally. That eShop promotion sale is a little weird, Swords and Soldiers is only $3 MSRP and some of the others are $10 and $15. I'm thinking about rebuying S&S for the 4th time just in case US gets the Guacamelee discount. I think its already on sale for $2 anyway. I almost bought it over the weekend buy my son and I played the Wiiware version - transfered over to Wii U oh so long ago - and it looked and played fine, close to full screen even, not the ugly blurry square I expected, so I didnt repurchase. Is Tekken the one with the Mario etc skins? Id pay $10 to wrestle Bowser as Mario even though I have no concept of Tekken - always been into the Soul Calibur series for my fighting fix. Good week for Europe WiiU. 60 Euro for a Angry birds...may I laugh?! Anyway, I am happy that there are a lot of interesting discounts lately. I already downloaded Master Reboot, Stick it to the man, Shovel knight, Another world 20th anniversary and Paper monster recut. I may also download Tetrobot and Wooden Sensei. And I guess I'll also go for Teslagrad. Its probably a lot cheaper then that retail-version (whenever that one arrives). Its also easier to get. Some nice discounts there. If One piece gets that in North America I might download that. Love them discounts! Great news about Axelay, I do miss my SFC. Had all Konami SFC games and this one reall impressed with the horizonal and vertical sections. The Mode 7 chip was used in an excellent way on the Vertical levels...who could forget the Fire planet and the first time you encountered the Flame Boss. The music to this game including the atmospheric intro is sublime. Looking forward to getting this again and for the poor Pal regions you get to play the game at 60Hz. @ULTRA-64 Good tip. I used to do that until someone said it was bad. But I think it is the saves thing? So will move them to flash. Will be able to get Tekken after all - nice ha. Mostly just replacements for my disc copies. Might also get Steamworld Dig if I have any money left. Bad week for my wallet. I had to get an external hard drive, now this! At least I now have the extra space. For me it's going to be Tekken, which has been in my wish list for quite a while, and Teslagrad. I already have 3 of the Indies, and I can't recommend them enough (Guacamelee, Runner 2 and Steamworld dig). Is the Tekken discount only for premium consoles ? @WWammy all WiiU discounts for the eShop are the same regardless of being on the premium or basic models. If you decide to get Tekken, I would suggest getting a portable hard drive because it's about 16 gig in size. The basic model doesn't have enough internal memory, even the premium model will find most of it's free space lost to this one game. Tbh though, you can pick up a used copy of Tekken Tag 2 for the same price anyway. Normally £19.99 but down to £6.79 temporary discount I'm not seeing that on my basic console. @WWammy That's because the downloads are not available till later today or tomorrow depending where you are.